Just ten percent of Canadians trust politicians, according to a recent Ipsos poll. Canadians are more likely to trust new car sales people than elected officials, data from Leger Marketing tell us. These facts may be good for a laugh. But, really, we shouldn’t be amused. The fact that Canadians are more likely to treat politicians as punch lines rather than persons to respect is a fundamental reason why we are tuning out politics. Barely 60 per cent of Canadians voted in the last federal election. And in Ontario’s fall provincial election, fewer than 50 per cent of eligible voters showed up at the ballot box. Our largest province has not seen such low turnout since confederation in 1867. Apathy is not a neutral force in our democracy. Apathy helps to sustain the status quo. And the status quo is not a friend of Canadians under 45. It is now urgent for Canadians under 45 to marshal our political voices and give politicians reason to earn our trust by making positive policy change. That’s one reason why I love and fear how Stephen Colbert is covering the US Republican Primaries. I love it because his show, The Colbert Report, engages younger audiences, using humour and satire to raise very serious questions about the excessive influence of wealth in election ads via ‘arms-length’ Super PACS (political action committees, which can raise and spend unlimited amounts of money for a candidate); to probe the status of corporations as persons; and to poke fun at the success of negative ads. I fear the satire, because I’m not sure it leaves many viewers with an alternate vision. Now that may not be the job of the satirist. But in a context where no one trusts politicians, it risks reinforcing the notion that politicians are punch lines, not persons to respect. The quality of our democracy desperately needs for Canadians to show greater charity in interpreting the activities of our politicians. So long as we don’t trust politicians in this country, we imply they can’t be trusted to help make positive change. When we don’t think they can make change, we don’t bother to encourage it, or demand it. This is especially true for Canadians under 45. With very little fanfare, the vast majority of elected officials work very long hours – more hours than most of us. This includes giving up a great deal of private time to attend community events and engage constituents. Most politicians are drawn to public service because they genuinely want to make our communities and our country better. Sure, we may disagree with some of their ideas about what constitutes improvement, but this doesn’t require that we disparage the person, or her or his commitment to the job. There is no doubt we will always need auditors general, judges, the media and others to scrutinize what politicians do, and how they spend tax dollars on our behalf – just as we must scrutinize activities in the financial sector, among doctors, police officers, teachers, etc. In any profession, the odd bad apple betrays our trust and the authority of their positions. But more generally, let’s all acknowledge there’s a big difference between the armchair coach and the one actually standing on the bench. It is easy to critique from the cheap seats where most of us sit, including me. It’s far more challenging to interpret the actions of others, including politicians, with charity. To approach them with a genuine interest in learning more about what constrains their legislating in ways you or I make may think makes common sense. So as Stephen Colbert, Captain America, valiantly satirizes the insane degree to which money influences democratic dialogue in North America, I think he needs a trusty sidekick – someone devoted to renewing respect for politicians. This is essential to restoring our beaver logic. Readers may know by now that I celebrate our national animal – the beaver – as a true community builder. Beavers build dams to create a reservoir that benefits the whole beaver community. When the reservoir is deep enough, beavers are efficient because they swim faster than they walk on land; they are safer out of the reach of predators; and they have ample room to build woodsy lodges as homes for their families. Whenever the dam springs a leak, busy beavers fix the dam, renovating it to withstand the new challenges in their environment. Beavers adapt because they all depend on the dam to safeguard their shared standard of living. Such beaver logic motivated me to start a new club on-line to complement Captain Colbert. I call it BEAVER for Politicians – short for Because Every Adequate Voter Expresses Respect for Politicians, even when s/he dislikes the decisions of certain politicians at certain times. Now, I don’t honestly expect this club will go viral. In truth, I’ll be happy if I get even 10 comments in response to this post. To get the ball rolling, I propose two reasons to trust politicians. First, on our behalf, politicians have made a massive, positive difference for seniors in this country. By implementing pension policy in combination with a strong economy, we have reduced poverty among seniors from 29 per cent in 1976 to less than 5 per cent today. That is a remarkable achievement, one to be proud of, and to respect. The achievement is so impressive, it should even motivate trust as Canadians renew debate about old age security, at least until specific policy proposals are tabled for evaluation. Second, politicians could replicate this achievement for younger generations of Canadians, in order to make it far easier to raise a family. But politicians are far less likely to do so, if no one shows it’s in their electoral interest. Electoral interest? It’s in far too short supply these days among voters. So I hope Captain Colbert motivates many more in Generation Squeeze to have fun, even party, as part of tuning into the political process. 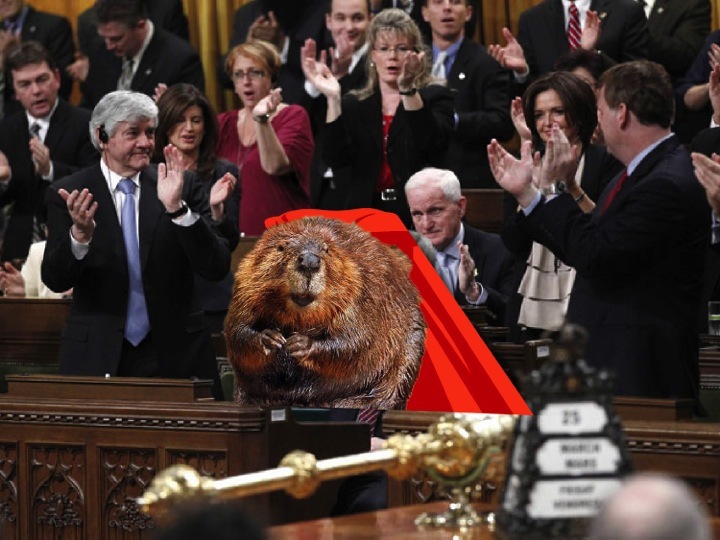 And I hope the BEAVER for Politicians can prove a trusty sidekick to instill renewed respect for those who devote themselves to public life. Only then are we likely to get out to the ballot box alongside Boomers to vote for the political champions of a Canada that works for all generations – including citizens under age 45. A full service digital creative agency that's all about working with the people and organizations that protect our planet and make the world a better place. We’re building a Canada that works for all generations. Join us. © Generation Squeeze. Click here to login. Check out Generation Squeeze. I just joined.